The president focuses on foreign policy in a two-hour interview at RT, Russia's English-language TV channel. President Vladimir Putin used the occasion of a two-hour-long live discussion at the new headquarters of RT, Russia’s English-language satellite news channel, to criticize the U.S. government’s National Security Agency over its use of surveillance of Google, Facebook, Apple and other Internet giants. Data surveillance is only acceptable if done within the law, Putin told RT editor-in-chief Margarita Simonyan during a visit to the state-funded channel’s studios in Moscow on June 11. “Such methods are in demand,” Putin said. “But you can’t just listen to the phone call in Russia; you need a special order from court. This is how this should be done in civilized society while tackling terrorism with the use of any technical means. If it is in the framework of the law, then it’s OK. If not, it is unacceptable,” Putin said. Commenting on U.S. President Barack Obama’s statement that “You can’t have 100 per cent security and 100 per cent privacy,” Putin disagreed, saying that both were possible - if surveillance was carried out within the law. Russia has said it could consider the possibility of granting political asylum to 29-year-old whistleblower Edward Snowden, if such a request is made. The ex-CIA employee disclosed the existence of PRISM, the NSA’s massive data-mining surveillance program, to UK newspaper The Guardian, earlier this week. “If we receive such a request, we will consider it,” Putin's press secretary Dmitry Peskov said. In a wide-ranging discussion, mostly focusing on foreign policy, Putin fielded questions from RT editor-in-chief Margarita Simoyan and several leading journalists at the channel, which was launched with Putin’s backing in 2005 as Russia Today, before being rebranded RT a couple of years later. Putin weighed in with a measured assessment of Iran’s nuclear policies, on one hand defending the Islamic republic for adhering to the rules on nuclear non-proliferation, but also criticizing Iran for its threats to Israel. Iran’s outgoing president, Mahmoud Ahmadinejad, has been outspoken in his comments about Israel, and Putin appeared to criticize the Iranian leader. "Iran is in a very difficult region and when we hear ... from Iran that Israel could be destroyed, I consider that absolutely unacceptable,” Putin said. “That does not help." But Putin also said that the United States was exaggerating the nuclear dangers posed by Iran, saying "the United States uses Iran to unite Western allies against some real or non-existent threat". In comments aimed at the United States, Putin said Soviet leader Joseph Stalin would not have dropped an atomic bomb like the Americans did at the end of World War II. Stalin “was a dictator and a tyrant, but I very much doubt that in the spring of 1945, if he had been in possession of an atomic bomb, he would have used it against Germany,” Putin said. "In 1941-42, when it was a question of life or death for the [Soviet Union], maybe he would have used it if he had it. But in 1945, when the enemy had essentially surrendered and had no chance, I very much doubt it," Putin said. "But the Americans used it against Japan, which was losing – against a non-nuclear state, by the way." The Russian president also accused U.S. diplomats of interfering in domestic Russian politics by supporting opposition demonstrators, a day before a June 12 protest march in Moscow. Putin also criticized the U.S. for its historical treatment of native Americans and African Americans. "It's no coincidence that Russia and the United States have united at critical periods in modern history - in WWI and WWII. 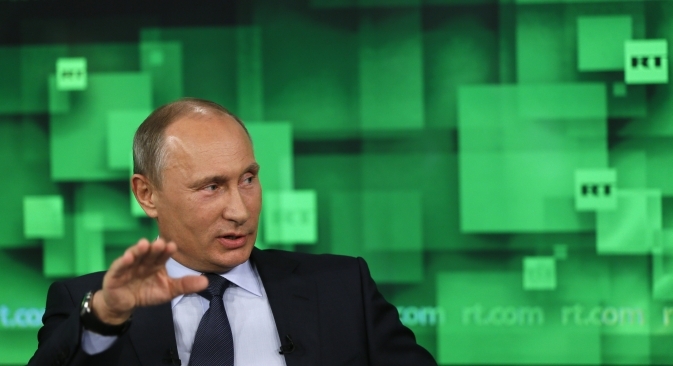 We were opposing one another, but when the chips were down we came together,” Putin said. “There is something that unites us, some fundamental interests that unite us." In answer to a question about the Syrian conflict, Putin criticized the government of President Bashar al-Assad, which he said should have pushed through reforms. “Had they done that, what we’re seeing in Syria today never would have happened,” Putin said. But Putin also confirmed his previous stance on Syria. “Considering that region’s background history, culture, religion, you cannot interfere with it from the outside,” Putin said.